This article is about aircraft landing gear. For the Devin the Dude album, see Landing Gear. For aircraft, the landing gear supports the craft when it is not flying, allowing it to take off, land, and taxi without damage. Wheels are typically used but skids, skis, floats or a combination of these and other elements can be deployed depending both on the surface and on whether the craft only operates vertically (VTOL) or is able to taxi along the surface. Faster aircraft usually have retractable undercarriages, which fold away during flight to reduce air resistance or drag. For launch vehicles and spacecraft landers, the landing gear is typically designed to support the vehicle only post-flight, and are typically not used for takeoff or surface movement. Aircraft landing gear usually includes wheels equipped with simple shock absorbers, or more advanced air/oil oleo struts, for runway and rough terrain landing. Some aircraft are equipped with skis for snow or floats for water, and/or skids or pontoons (helicopters). It represents 2.5 to 5% of the MTOW and 1.5 to 1.75% of the aircraft cost but 20% of the airframe direct maintenance cost; each wheel can support up to 30 t (66,000 lb), reach over 300 km/h, roll up to 500,000 km (310,000 mi) ; it has a 20,000 hours time between overhaul and a 60,000 hours or 20 years life time. The undercarriage is typically 4–5% of the takeoff mass and can even reach 7%. tricycle undercarriage where there are two main wheels (or wheel assemblies) under the wings and a third smaller wheel in the nose. The taildragger arrangement was common during the early propeller era, as it allows more room for propeller clearance. Most modern aircraft have tricycle undercarriages. Taildraggers are considered harder to land and take off (because the arrangement is usually unstable, that is, a small deviation from straight-line travel will tend to increase rather than correct itself), and usually require special pilot training. Sometimes a small tail wheel or skid is added to aircraft with tricycle undercarriage, in case of tail strikes during take-off. The Concorde, for instance, had a retractable tail "bumper" wheel, as delta winged aircraft need a high angle when taking off. Both Boeing's largest WWII bomber, the B-29 Superfortress, and the 1960s-introduced Boeing 727 trijet airliner each have a retractable tail bumper. Some aircraft with retractable conventional landing gear have a fixed tailwheel, which generates minimal drag (since most of the airflow past the tailwheel has been blanketed by the fuselage) and even improves yaw stability in some cases. Another arrangement sometimes used is central main and nose gear with outriggers on the wings. This may be done where there is no convenient location on either side to attach the main undercarriage or to store it when retracted. Examples include the Lockheed U-2 spy plane and the Harrier Jump Jet. The B-52 bomber uses a similar arrangement, except that each end of the fuselage has two sets of wheels side by side. To decrease drag in flight some undercarriages retract into the wings and/or fuselage with wheels flush against the surface or concealed behind doors; this is called retractable gear. If the wheels rest protruding and partially exposed to the airstream after being retracted, the system is called semi-retractable. Most retraction systems are hydraulically operated, though some are electrically operated or even manually operated. This adds weight and complexity to the design. In retractable gear systems, the compartment where the wheels are stowed are called wheel wells, which may also diminish valuable cargo or fuel space. ] Pilots confirming that their landing gear is down and locked refer to "three greens" or "three in the green. ", a reference to the electrical indicator lights (or painted panels of mechanical indicator units) from the nosewheel/tailwheel and the two main gears. Blinking green lights or red lights indicate the gear is in transit and neither up and locked or down and locked. When the gear is fully stowed up with the up-locks secure, the lights often extinguish to follow the dark cockpit philosophy; some airplanes have gear up indicator lights. Multiple redundancies are usually provided to prevent a single failure from failing the entire landing gear extension process. Whether electrically or hydraulically operated, the landing gear can usually be powered from multiple sources. In case the power system fails, an emergency extension system is always available. This may take the form of a manually operated crank or pump, or a mechanical free-fall mechanism which disengages the uplocks and allows the landing gear to fall due to gravity. Some high-performance aircraft may even feature a pressurized-nitrogen back-up system. As aircraft grow larger, they employ more wheels to cope with the increasing weights. The earliest "giant" aircraft ever placed in quantity production, the Zeppelin-Staaken R.VI German World War I long-range bomber of 1916, used a total of eighteen wheels for its undercarriage, split between two wheels on its nose gear struts, and a total of sixteen wheels on its main gear units — split into four side-by-side quartets each, two quartets of wheels per side — under each tandem engine nacelle, to support its loaded weight of almost 12 metric tons. Multiple "tandem wheels" on an aircraft — particularly for cargo aircraft, mounted to the fuselage lower sides as retractable main gear units on modern designs — were first seen during World War II, on the experimental German Arado Ar 232 cargo aircraft, which used a row of eleven "twinned" fixed wheel sets directly under the fuselage centerline to handle heavier loads while on the ground. Many of today's large cargo aircraft use this arrangement for their retractable main gear setups (usually mounted on the lower corners of the central fuselage structure). The Airbus A340-500/-600 has an additional four-wheel undercarriage bogie on the fuselage centerline, much like the twin-wheel unit in the same general location, used on later DC-10 and MD-11 airliners. The Boeing 747 has five sets of wheels: a nosewheel assembly and four sets of four-wheel bogies. A set is located under each wing, and two inner sets are located in the fuselage, a little rearward of the outer bogies, adding up to a total of eighteen wheels and tires. The Airbus A380 also has a four-wheel bogie under each wing with two sets of six-wheel bogies under the fuselage. The world's largest jet cargo aircraft, the Soviet Antonov An-225 has 4 wheels on the twin-strut nose gear units (as its smaller "stablemate", the Antonov An-124 also uses), and 28 main gear wheel/tire units, adding up to a total of 32 wheels and tires. Some aircraft have landing gear adapted to take off from and land on water. A floatplane has landing gear comprising two or more streamlined floats. A flying boat has a lower fuselage possessing the shape of a boat hull giving it buoyancy, usually with a "step" near the center of gravity to allow the aircraft to more easily break free of the water's surface for takeoff. Additional landing gear is often present, typically comprising wing-mounted floats, or more rarely, stub-wing like sponsons on the lower sides of the fuselage, with their lower surfaces even with the chines forming the longitudinal lower corners of a flying boat's lower hull contours. Helicopters able to land on water may have floats or a hull. An amphibious aircraft has landing gear for both land and water-based operation. When an airplane needs to land on surfaces covered by snow, the landing gear usually consists of skis or a combination of wheels and skis. Some aircraft use wheels for takeoff and then jettison them soon afterwards for improved aerodynamic streamlining without the complexity, weight and space requirements of a retraction mechanism. In these cases, the wheels to be jettisoned are sometimes mounted onto axles that are part of a separate "dolly" (for main wheels only) or "trolley" (for a three-wheel set with a nosewheel) chassis. Landing is then accomplished on skids or similar other simple devices. Historical examples include the "dolly"-using Messerschmitt Me 163 Komet rocket fighter, the Messerschmitt Me 321 Gigant troop glider, and the first eight "trolley"-using prototypes of the Arado Ar 234 jet reconnaissance bomber. The main disadvantage to using the takeoff dolly/trolley and landing skid(s) system on German World War II aircraft – intended for a sizable number of late-war German jet and rocket-powered military aircraft designs – was that aircraft would likely be scattered all over a military airfield after they had landed from a mission, and would be unable to taxi on their own to an appropriately hidden "dispersal" location, which could easily leave them vulnerable to being shot up by attacking Allied fighters. A related contemporary example are the wingtip support wheels ("pogos") on the Lockheed U-2 reconnaissance aircraft, which fall away after take-off and drop to earth; the aircraft then relies on titanium skids on the wingtips for landing. 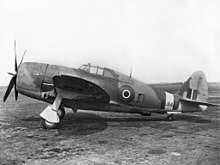 A Royal Air Force P-47 with its raked-forward main gear, and rearward-angled main wheel position (when retracted) indicated by the just-visible open wheel door. Some main landing gear struts on World War II aircraft, in order to allow a single-leg main gear to more efficiently store the wheel within either the wing or an engine nacelle, rotated the single gear strut through a 90° angle during the rearwards-retraction sequence to allow the main wheel to rest "flat" above the lower end of the main gear strut, or flush within the wing or engine nacelles, when fully retracted. Examples are the Curtiss P-40, Vought F4U Corsair, Grumman F6F Hellcat, Messerschmitt Me 210 and Junkers Ju 88. The Aero Commander family of twin-engined business aircraft also shares this feature on the main gears, which retract aft into the ends of the engine nacelles. The rearward-retracting nosewheel strut on the Heinkel He 219 and the forward-retracting nose gear strut on the later Cessna Skymaster similarly rotated 90 degrees as they retracted. On most World War II single-engined fighter aircraft (and even one German heavy bomber design) with sideways retracting main gear, the main gear that retracted into the wings was meant to be raked forward, towards the aircraft's nose in the "down" position for better ground handling, with a retracted position that placed the main wheels at some angle "behind" the main gear's attachment point to the airframe – this led to a complex angular geometry for setting up the "pintle" angles at the top ends of the struts for the retraction mechanism's axis of rotation, with some aircraft, like the P-47 Thunderbolt and Grumman Bearcat, even mandating that the main gear struts lengthen as they were extended down from the wings to assure proper ground clearance for their large four-bladed propellers. One exception to the need for this complexity in many WW II fighter aircraft was Japan's famous Zero fighter, whose main gear stayed at a perpendicular angle to the centerline of the aircraft when extended, as seen from the side. An unusual undercarriage configuration is found on the Hawker Siddeley Harrier, which has two mainwheels in line astern under the fuselage (called a bicycle or tandem layout) and a smaller wheel near the tip of each wing. On second generation Harriers, the wing is extended past the outrigger wheels to allow greater wing-mounted munition loads to be carried, or to permit wing-tip extensions to be bolted on for ferry flights. A multiple tandem layout was used on some military jet aircraft during the 1950s, pioneered by the Martin XB-51, and later used on such aircraft as the U-2, Myasishchev M-4, Yakovlev Yak-25, Yak-28, Sud Aviation Vautour, and the B-47 Stratojet because it allows room for a large internal bay between the main wheels. A variation of the multi tandem layout is also used on the B-52 Stratofortress which has four main wheel bogies (two forward and two aft) underneath the fuselage and a small outrigger wheel supporting each wing-tip. The B-52's landing gear is also unique in that all four pairs of main wheels can be steered. This allows the landing gear to line up with the runway and thus makes crosswind landings easier (using a technique called crab landing). Since tandem aircraft cannot rotate for takeoff, the forward gear must be long enough to give the wings the correct angle of attack during takeoff. During landing, the forward gear must not touch the runway first, otherwise the rear gear will slam down and cause the aircraft to bounce off the runway. One very early undercarriage arrangement that passively allowed for castoring during crosswind landings, unlike the "active" arrangement on the B-52, was pioneered on the Bleriot VIII design of 1908. It was later used in the much more famous Blériot XI Channel-crossing aircraft of 1909 and also copied in the earliest examples of the Etrich Taube. In this arrangement the main landing gear's shock absorption was taken up by a vertically sliding bungee cord-sprung upper member. The vertical post along which the upper member slid to take landing shocks also had its lower end as the rotation point for the forward end of the main wheel's suspension fork, allowing the main gear to pivot on moderate crosswind landings. One of the very first aircraft to use a "kneeling" function in its undercarriage design was the World War II German Arado Ar 232 cargo/transport aircraft, produced in small numbers as both a twin-engined version, and one with four engines - both the nosegear, and the wing-mounted, inwards-retracting main landing gear were designed to have a "kneeling" function in their design to assist in loading/unloading cargo, and to also allow its unique, exposed fixed ventral fuselage-centreline set of eleven "twinned" auxiliary wheel sets to more firmly support the fuselage on soft ground, and to enable taxiing the aircraft over ditches and other ground obstacles. Some early U.S. Navy jet fighters were equipped with “kneeling” nose gear consisting of small steerable auxiliary wheels on short struts located forward of the primary nose gear, allowing the aircraft to be taxied tail-high with the primary nose gear retracted. This feature was intended to enhance safety aboard aircraft carriers by redirecting the hot exhaust blast upwards, and to reduce hangar space requirements by enabling the aircraft to park with its nose underneath the tail of a similarly equipped jet. 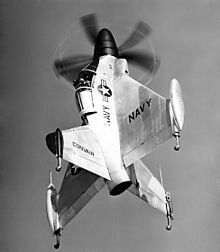 Kneeling gear was used on the North American FJ-1 Fury and on early versions of the McDonnell F2H Banshee, but was found to be of little use operationally, and was omitted from later Navy fighters. The nosewheel gear systems of some large cargo jets, like the Antonov An-124 Condor, kneel to assist in loading and unloading of cargo using ramps through the forward, "tilt-up" hinged fuselage nose while stationary on the ground. To minimize drag, modern gliders usually have a single wheel, retractable or fixed, centered under the fuselage, which is referred to as monowheel gear or monowheel landing gear. Monowheel gear is also used on some powered aircraft, where drag reduction is a priority, such as the Europa XS. Much like the Me 163 rocket fighter, some gliders from prior to the Second World War used a take-off dolly that was jettisoned on take-off and then landed on a fixed skid. This configuration is necessarily accompanied with a taildragger. Light helicopters tend to use simple landing skids to save weight and cost. They include attachment points for wheels so that they can be moved for short distances on the ground. Skids are impractical for helicopters weighing more than four tons. Some high-speed machines have retractable wheels, but most use fixed wheels for their robustness, and to avoid the need for a retraction mechanism. Experimental tailsitter aircraft use landing gear located in their tails for VTOL operation. For light aircraft a type of landing gear which is economical to produce is a simple wooden arch laminated from ash, as used on some homebuilt aircraft. A similar arched gear is often formed from spring steel. The Cessna Airmaster was among the first aircraft to use spring steel landing gear. The main advantage of such gear is that no other shock-absorbing device is needed; the deflecting leaf provides the shock absorption. Ju 288 V1 first prototype, showing its complex "folding" main undercarriage. In order to save precious space, various folding and splayable landing gear designs have been created. The German Bomber B combat aircraft design competition winner, the Junkers Ju 288, had a complex "folding" main landing gear unlike any other aircraft designed by either Axis or Allied sides in the war: its single oleo strut was only attached to the lower end of its Y-form main retraction struts, handling the twinned main gear wheels, and folding by swiveling downwards and aftwards during retraction to "fold" the maingear's length to shorten it for stowage in the engine nacelle it was mounted in. However, the single pivot-point design also led to numerous incidents of collapsed maingear units for its prototype airframes. The idea behind a ground carriage is to leave the landing gear on the runway and not take it into the air, in order to reduce weight and drag. Examples include the "dolly" and "trolley" arrangements, respectively of the German Me 163B rocket fighter and Arado Ar 234A prototype jet recon-bomber designs of World War II, as their wheeled "ground carriages" were not usually allowed to either remain attached to the airframe, nor carried vary far away from the ground, during a normal takeoff procedure for either design. There are several types of steering. Taildragger aircraft may be steered by rudder alone (depending upon the prop wash produced by the aircraft to turn it) with a freely pivoting tail wheel, or by a steering linkage with the tail wheel, or by differential braking (the use of independent brakes on opposite sides of the aircraft to turn the aircraft by slowing one side more sharply than the other). Aircraft with tricycle landing gear usually have a steering linkage with the nosewheel (especially in large aircraft), but some allow the nosewheel to pivot freely and use differential braking and/or the rudder to steer the aircraft, like the Cirrus SR22. Some aircraft require that the pilot steer by using rudder pedals; others allow steering with the yoke or control stick. Some allow both. Still others have a separate control, called a tiller, used for steering on the ground exclusively. When an aircraft is steered on the ground exclusively using the rudder, turning the plane requires that a substantial airflow be moving past the rudder, which can be generated either by the forward motion of the aircraft or by thrust provided by the engines. Rudder steering requires considerable practice to use effectively. Although it requires air movement, it has the advantage of being independent of the landing gear, which makes it useful for aircraft equipped with fixed floats or skis. Some aircraft link the yoke, control stick, or rudder directly to the wheel used for steering. Manipulating these controls turns the steering wheel (the nose wheel for tricycle landing gear, and the tail wheel for taildraggers). The connection may be a firm one in which any movement of the controls turns the steering wheel (and vice versa), or it may be a soft one in which a spring-like mechanism twists the steering wheel but does not force it to turn. The former provides positive steering but makes it easier to skid the steering wheel; the latter provides softer steering (making it easy to overcontrol) but reduces the probability of skidding. Aircraft with retractable gear may disable the steering mechanism wholly or partially when the gear is retracted. Differential braking depends on asymmetric application of the brakes on the main gear wheels to turn the aircraft. For this, the aircraft must be equipped with separate controls for the right and left brakes (usually on the rudder pedals). The nose or tail wheel usually is not equipped with brakes. Differential braking requires considerable skill. In aircraft with several methods of steering that include differential braking, differential braking may be avoided because of the wear it puts on the braking mechanisms. Differential braking has the advantage of being largely independent of any movement or skidding of the nose or tailwheel. A tiller in an aircraft is a small wheel or lever, sometimes accessible to one pilot and sometimes duplicated for both pilots, that controls the steering of the aircraft while it is on the ground. The tiller may be designed to work in combination with other controls such as the rudder or yoke. In large airliners, for example, the tiller is often used as the sole means of steering during taxi, and then the rudder is used to steer during takeoff and landing, so that both aerodynamic control surfaces and the landing gear can be controlled simultaneously when the aircraft is moving at aerodynamic speeds. The specified selection criterion, e.g., minimum size, weight, or pressure, are used to select suitable tires and wheels from manufacturer's catalog and industry standards found in the Aircraft Yearbook published by the Tire and Rim Association, Inc.
are the distance measured from the aircraft's center of gravity(cg) to the main and nose gear, respectively. To ensure that the rated loads will not be exceeded in the static and braking conditions, a seven percent safety factor is used in the calculation of the applied loads. Provided that the wheel load and configuration of the landing gear remain unchanged, the weight and volume of the tire will decrease with an increase in inflation pressure. From the flotation standpoint, a decrease in the tire contact area will induce a higher bearing stress on the pavement, thus eliminates certain airports from the aircraft's operational bases. Braking will also become less effective due to a reduction in the frictional force between the tires and the ground. In addition, the decrease in the size of the tire, and hence the size of the wheel, could pose a problem if internal brakes are to be fitted inside the wheel rims. The arguments against higher pressure are of such a nature that commercial operators generally prefer the lower pressures in order to maximize tire life and minimize runway stress. 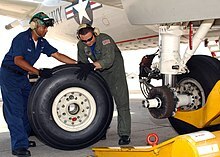 To prevent punctures from stones Philippine Airlines had to operate their Hawker Siddeley 748 aircraft with pressures as low as the tire manufacturer would permit. However, too low a pressure can lead to an accident as in the Nigeria Airways Flight 2120. A rough general rule for required tire pressure is given by the manufacturer in their catalog. Goodyear for example advises the pressure to be 4% higher than required for a given weight or as fraction of the rated static load and inflation. Tires of many commercial aircraft are required to be filled with nitrogen or low-oxygen air to prevent the internal combustion of the tire which may result from overheating brakes producing volatile hydrocarbons from the tire lining. Malfunctions or human errors (or a combination of these) related to retractable landing gear have been the cause of numerous accidents and incidents throughout aviation history. 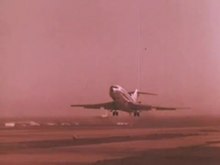 Distraction and preoccupation during the landing sequence played a prominent role in the approximately 100 gear-up landing incidents that occurred each year in the United States between 1998 and 2003. A gear-up landing incident, also known as a belly landing, is an accident that may result from the pilot simply forgetting, or failing, to lower the landing gear before landing or a mechanical malfunction that does not allow the landing gear to be lowered. Although rarely fatal, a gear-up landing is very expensive, as it causes massive airframe damage. If the landing results in a prop strike, a complete engine rebuild may also be required. Many aircraft between the wars – at the time when retractable gear was becoming commonplace – were deliberately designed to allow the bottom of the wheels to protrude below the fuselage even when retracted to reduce the damage caused if the pilot forgot to extend the landing gear or in case the plane was shot down and forced to crash-land. Examples include the Avro Anson, Boeing B-17 Flying Fortress, and the Douglas DC-3. The modern-day Fairchild Republic A-10 Thunderbolt II carries on this legacy: it is similarly designed in an effort to avoid (further) damage during a gear-up landing, a possible consequence of battle damage. Some aircraft have a stiffened fuselage bottom or added firm structures, designed to minimize structural damage in a wheels-up landing. When the Cessna Skymaster was converted for a military spotting role (the O-2 Skymaster), fiberglass railings were added to the length of the fuselage; they were adequate to support the aircraft without damage if it was landed on a grassy surface. The Bombardier Dash 8 is notorious for its landing gear problems. There were three incidents involved, all of them involving Scandinavian Airlines, flights SK1209, SK2478, and SK2867. This led to Scandinavian retiring all of its Dash 8s. The cause of these incidents was a locking mechanism that failed to work properly. This also caused concern for the aircraft for many other airlines that found similar problems, Bombardier Aerospace ordered all Dash 8s with 10,000 or more hours to be grounded, it was soon found that 19 Horizon Airlines Dash 8s had locking mechanism problems, so did 8 Austrian Airlines planes, this did cause several hundred flights to be canceled. On September 21, 2005, JetBlue Airways Flight 292 successfully landed with its nose gear turned 90 degrees sideways, resulting in a shower of sparks and flame after touchdown. This type of incident is very uncommon as the nose oleo struts are designed with centering cams to hold the nosewheels straight until they are compressed by the weight of the aircraft. On November 1, 2011, LOT Polish Airlines Flight LO16 successfully belly landed at Warsaw Chopin Airport due to technical failures; all 231 people on board escaped without injury. In the event of a failure of the aircraft's landing gear extension mechanism a backup is provided. This may be an alternate hydraulic system, a hand-crank, compressed air (nitrogen), pyrotechnic or free-fall system. A free-fall or gravity drop system uses gravity to deploy the landing gear into the down and locked position. To accomplish this the pilot activates a switch or mechanical handle in the cockpit, which releases the up-lock. Gravity then pulls the landing gear down and deploys it. Once in position the landing gear is mechanically locked and safe to use for landing. Rotorcraft with fully articulated rotors may experience a dangerous and self-perpetuating phenomenon known as ground resonance, in which the unbalanced rotor system vibrates at a frequency coinciding with the natural frequency of the airframe, causing the entire aircraft to violently shake or wobble in contact with the ground. Ground resonance occurs when shock is continuously transmitted to the turning rotors through the landing gear, causing the angles between the rotor blades to become uneven; this is typically triggered if the aircraft touches the ground with forward or lateral motion, or touches down on one corner of the landing gear due to sloping ground or the craft's flight attitude. The resulting violent oscillations may cause the rotors or other parts to catastrophically fail, detach, and/or strike other parts of the airframe; this can destroy the aircraft in seconds and critically endanger persons unless the pilot immediately initiates a takeoff or closes the throttle and reduces rotor pitch. Ground resonance was cited in 34 National Transportation Safety Board incident and accident reports in the United States between 1990 and 2008. Rotorcraft with fully articulated rotors typically have shock-absorbing landing gear designed to prevent ground resonance; however, poor landing gear maintenance and improperly inflated tires may contribute to the phenomenon. Helicopters with skid-type landing gear are less prone to ground resonance than those with wheels. Unauthorized passengers have been known to stowaway on larger aircraft by climbing a landing gear strut and riding in the compartment meant for the wheels. There are extreme dangers to this practice, with numerous deaths reported. Dangers include a lack of oxygen at high altitude, temperatures well below freezing, crush injury or death from the gear retracting into its confined space, and falling out of the compartment during takeoff or landing. Landing gear has traditionally not been used on the vast majority of space launch vehicles, which take off vertically and are destroyed on falling back to earth. With some exceptions for suborbital vertical-landing vehicles (e.g., Masten Xoie or the Armadillo Aerospace' Lunar Lander Challenge vehicle), or for spaceplanes that use the vertical takeoff, horizontal landing (VTHL) approach (e.g., the Space Shuttle, or the USAF X-37), landing gear have been largely absent from orbital vehicles during the early decades since the advent of spaceflight technology, when orbital space transport has been the exclusive preserve of national-monopoly governmental space programs. Each spaceflight system to date has relied on expendable boosters to begin each ascent to orbital velocity. Recent advances in private space transport, where new competition to governmental space initiatives has emerged, have included the explicit design of landing gear into orbital booster rockets. SpaceX has initiated and funded a multimillion-dollar reusable launch system development program to pursue this objective. As part of this program, SpaceX built, and flew eight times in 2012–2013, a first-generation booster-test-vehicle with a large fixed landing gear in order to test low-altitude vehicle dynamics and control for vertical landings of a near-empty orbital first stage. A second-generation larger booster test vehicle was built with extensible landing gear. The first prototype was flown four times—with all landing attempts successful—in 2014 for low-altitude tests before being self-destructed for safety reasons on a fifth test flight due to a blocked engine sensor port. The orbital-flight version of the SpaceX design—being flown on both Falcon 9 and Falcon Heavy launch vehicles—includes a lightweight, deployable landing gear for the booster stage: a nested, telescoping piston on an A-frame. The total span of the four carbon fiber/aluminum extensible landing legs is approximately 18 metres (60 ft), and weigh less than 2,100 kilograms (4,600 lb); the deployment system uses high-pressure Helium as the working fluid. The first test of the extensible landing gear was successfully accomplished in April 2014 on a Falcon 9 rocket returning from an orbital launch and was the first successful controlled ocean soft touchdown of a liquid-rocket-engine orbital booster. The newest launch vehicle under development at SpaceX—the BFR—has no traditional landing gear on its first stage (BFR booster). In order to reduce mass of the flight vehicle and the payload penalty for a reusable design, the vertical landing of the reusable rocket will occur directly back at the launch site on special ground equipment that is part of the launch mount. Comet lander Philae showing landing gear. Each pad at the end of each of the lander legs has an ice screw, necessary for attachment to a celestial body with a very low gravitational field. Spacecraft designed to land safely on extraterrestrial bodies such as the Moon or Mars usually have landing gear. Such landers include the Apollo Lunar Module as well as a number of robotic space probe landers. Examples include Viking 1 lander, the first lander to successfully land on Mars (November 1976), and Philae which arrived at comet 67P/Churyumov–Gerasimenko in 2014 after a 10-year transit and landed on the comet on 12 November 2014. Spacecraft with landing gear designed for use on non-terrestrial surfaces now under development include Prospector-1, with launch planned by 2020, and the large 85-tonne (187,000 lb) BFR spaceship, being developed for flight in the early 2020s. Dayton-Wright Racer, an early example of an airplane with retractable landing gear. Undercarriage arrangements of jetliners and other aircraft. Verville Racer Aircraft, an early example of an airplane with retractable landing gear. ^ Gerd Roloff (April 2002). "Aircraft Landing Gear" (PDF). Airbus-Deutschland GmbH. The Evolution of a System. ^ Kundu, Ajoy Kumar (2010). Aircraft Design. New York: Cambridge University Press. p. 194. ISBN 978-1-139-48745-0. ^ AMT Airframe Handbook Volume 2 (FAA-H-8083-31). Washington DC: FAA. pp. 13–24. ^ Sengfelder, Günther (1993). German Aircraft Landing Gear. Atglen, PA USA: Schiffer Publishing. pp. 40–42. ISBN 0-88740-470-7. A significant advantage of this [Ar 232] aircraft was its rough-field landing gear. With the landing gear in the compressed position, the eleven pairs of wheels mounted on independently-sprung legs beneath the fuselage, together with the wide-track main landing gear (8.4 meter, 27 ft 6 in wheel track) and the levered-suspension nose wheel, endowed the aircraft with outstanding rough field capabilities. ^ Tarantola, Andrew. "The World's Largest Cargo Plane Can Swallow a 737 Whole". gizmodo.com. ^ Canada Aviation and Space Museum (n.d.). "Messerschmitt Me 163B-1a Komet". Retrieved 13 May 2012. ^ "Aerostories: Arado 234, July - August 1944: no ordinary missions." Aerostories. Retrieved: 16 March 2016. ^ Sengfelder, Günther (1993). German Aircraft Landing Gear. Atglen, PA USA: Schiffer Publishing. pp. 141–142. ISBN 0-88740-470-7. During retraction the nosewheel had to turn through 90 degrees, which was achieved by means of a mechanism in the head of the wheel fork. On retraction, a spring-loaded level with pulley, which limited deflection to 60 degrees by means of a locking hook and stop, was folded into the fuselage and turned through ninety degrees after making contact with a guide. ^ Dow, Andrew (February 19, 2015). Pegasus: The Heart of the Harrier (2 ed.). Pen and Sword. p. 312. ISBN 978-1-84884-042-3. ^ The B-47. Lookout Mountain Air Force Station. 1950. ^ "North American NA-141 Fury (FJ-1)". Yanks Air Museum. Archived from the original on 18 December 2015. Retrieved 23 January 2016. ^ Mesko, Jim (2002). FH Phantom/F2H Banshee in action. Carrollton, Texas, USA: Squadron/Signal Publications, Inc. p. 12. ISBN 0-89747-444-9. ^ "Europa XS Monowheel Overview". Europa Aircraft Ltd. 2011. Retrieved 13 May 2012. ^ Cox, Taylor. "Skids or Wheels?". helis.com. Retrieved 3 March 2018. ^ a b c d Chai, Sonny T.; Mason, William H. (September 1, 1996). Landing Gear Integration in Aircraft Conceptual Design (PDF). NASA CR-205551. MAD 96-09-01 (revised March 1, 1997 ed.). Blacksburg, Virginia: Virginia Polytechnic Institute and State University. OCLC 39005288. Retrieved 25 October 2018 – via NASA. Lay summary. ^  Goodyear Tire & Rubber Co., Retrieved: 26 January 2012. ^ The Office of the NASA Aviation Safety Reporting System (January 2004). "Gear Up Checkup" (PDF). Call Back ASRS. NASA (292). Retrieved 1 April 2012. ^ Scislowska, Monika (3 November 2011). "Warsaw airport back to work after plane emergency". MSNBC. Retrieved 13 January 2012. ^ "Boeing 757 Landing Gear". Biggles Software. 29 December 2011. Archived from the original on 24 March 2009. Retrieved 13 May 2012. ^ Stellan F. Hilmerby (24 November 2009). "Landing Gear". Stellans Flightsim Pages. Retrieved 13 May 2012. ^ a b c d e Garrison, Peter (December 2008). "How Things Work: Ground Resonance". airspacemag.com. Air and Space Magazine. Retrieved 6 November 2018. ^ a b c d "Rotorcraft Flying Handbook" (PDF). faa.gov. Federal Aviation Administration. 2000. p. 11-7. Retrieved 6 November 2018. ^ "Wheel-well Stowaways Risk Lethal Levels of Hypoxia and Hypothermia" (PDF). Flight Safety Foundation. May–June 1997. Retrieved 15 June 2015. ^ Hanlon, Michael (2013-06-11). "Roll up for the Red Planet". The Telegraph. Retrieved 2013-10-26. the space race is flaring back into life, and it's not massive institutions such as Nasa that are in the running. The old view that human space flight is so complex, difficult and expensive that only huge government agencies could hope to accomplish it is being disproved by a new breed of flamboyant space privateers, who are planning to send humans out beyond the Earth's orbit for the first time since 1972. ^ Foust, Jeff (2013-10-18). "SpaceX wrapping up Falcon 9 second stage investigation as it moves on from Grasshopper". NewSpace Journal. Retrieved 2013-10-26. ^ Klotz, Irene (2013-10-17). "SpaceX Retires Grasshopper, New Test Rig To Fly in December". Space News. Retrieved 2013-10-26. ^ Foust, Jeff (2014-08-23). "Falcon 9 test vehicle destroyed in accident". NewSpace Journal. Retrieved 2014-08-23. ^ "Landing Legs". SpaceX News. 2013-07-29. Retrieved 2013-07-30. The Falcon 9 first stage carries landing legs which will deploy after stage separation and allow for the rocket’s soft return to Earth. The four legs are made of state-of-the-art carbon fiber with aluminum honeycomb. Placed symmetrically around the base of the rocket, they stow along the side of the vehicle during liftoff and later extend outward and down for landing. ^ "Landing Legs". SpaceX News. 2013-04-12. Retrieved 2013-08-02. The Falcon Heavy first stage center core and boosters each carry landing legs, which will land each core safely on Earth after takeoff. After the side boosters separate, the center engine in each will burn to control the booster’s trajectory safely away from the rocket. The legs will then deploy as the boosters turn back to Earth, landing each softly on the ground. The center core will continue to fire until stage separation, after which its legs will deploy and land it back on Earth as well. The landing legs are made of state-of-the-art carbon fiber with aluminum honeycomb. The four legs stow along the sides of each core during liftoff and later extend outward and down for landing. ^ Belfiore, Michael (April 22, 2014). "SpaceX Brings a Booster Safely Back to Earth". MIT Technology Review. Retrieved April 25, 2014. ^ Norris, Guy (April 28, 2014). "SpaceX Plans For Multiple Reusable Booster Tests". Aviation Week. Retrieved April 27, 2014. The April 17 F9R Dev 1 flight, which lasted under 1 min., was the first vertical landing test of a production-representative recoverable Falcon 9 v1.1 first stage, while the April 18 cargo flight to the ISS was the first opportunity for SpaceX to evaluate the design of foldable landing legs and upgraded thrusters that control the stage during its initial descent. ^ a b Musk, Elon (1 March 2018). "Making Life Multi-Planetary". New Space. 6 (1). Retrieved 2 April 2018. ^ Sample, Ian; Clark, Stuart (13 November 2014). "Rosetta mission: Philae makes historic first landing on comet". the Guardian. ^ Rkaina, Sam (6 August 2014). "Rosetta probe: Recap updates after spacecraft successfully reached deep space comet orbit". Daily Mirror. Retrieved 24 August 2014. ^ S. Ulamec; S. Espinasse; B. Feuerbacher; M. Hilchenbach; D. Moura; H. Rosenbauer; H. Scheuerle; R. Willnecker (2006). "Rosetta Lander—Philae: Implications of an alternative mission". Acta Astronautica. 58 (8): 435–441. Bibcode:2006AcAau..58..435U. doi:10.1016/j.actaastro.2005.12.009. ^ J. Biele (2002). "The Experiments Onboard the ROSETTA Lander". Journal Earth, Moon, and Planets. 90 (1–4): 445–458. Bibcode:2002EM&P...90..445B. doi:10.1023/A:1021523227314. ^ Benton, Dale (2016-08-09). "Deep Space Industries' mining ambitions move one step closer with Prospector-1". Mining Global. Retrieved 2016-08-09. Wikimedia Commons has media related to Undercarriages. "Standard Naming Convention for Aircraft Landing Gear Configurations" (PDF). FAA. October 6, 2005. Scholz, Dieter. "Summary: Aircraft Design in a Nutshell". Aircraft Design: Lecture Notes (PDF). Hamburg, Germany: Hamburg Open Online University (HOOU). pp. 19–20. Retrieved 2 November 2018. Lay summary.